Brill Sylvie, keep up the good work! Gorgeous - love that flower. What a beautiful flower Sylvie... you are doing us proud this week! Oh WOW!!! Simply FAB cards! And all so different! :) Great job in helping reach that 1000 mark! Thanks for helping us towards our 1000 target! Beautiful card...Love the flower. Very elegant. O so pretty, so pretty. Love what you've done with that big flower. I LOVE the huge flower on this, settled nicely on a textured bit of white. Beautiful! 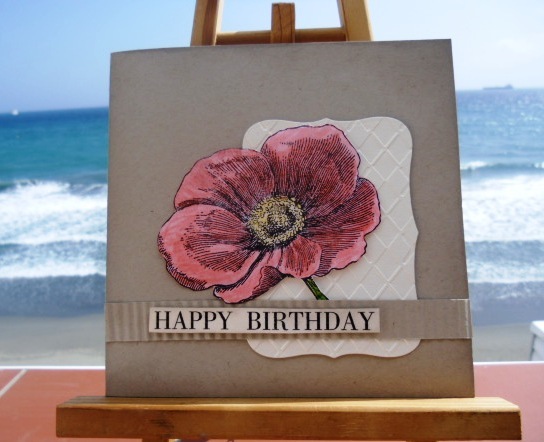 A beautiful CAS card Sylvie - love the flower stamp and the embossed panel. I think Chrissie and Mandi will meet their target! Another beauty, just love the stunning flower looks really wonderful against the Kraft cardstock.